Gujarat is known for having a rich base of natural resources, whether they are various beaches or forests located at different locations , not to mention the famous Gir forest, famous for the Asiatic Lions. During the holiday season, people in Gujarat head towards one of the known beaches of Gujarat or visit a nearby forest location. 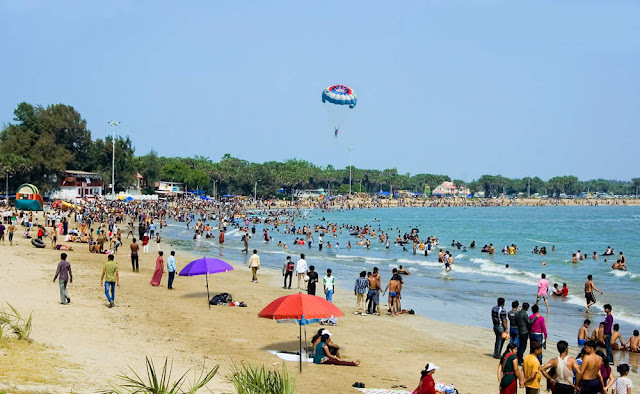 There are many beaches in Gujarat like the Diu Beach, the tithal beach, the Mandvi Beach, The Dwarka Beach, The chorwad beach, The somnath beach and other beaches. The Diu beach is where people of Gujarat head to, during summer times. Diu is located close to Junagadh with 120 km distance and about 370 km from Ahmadabad. Diu is an island famous for its many beaches. Diu is an union territory of India. The town or the island of Diu is also known as a fishing town. The Diu island is at sea level and covers distance area of about 38.8 sq. km. The coastline of Diu is estimated to be only about 9 km. There are many beaches of Diu like the Nagoa beach, the Goghala beach and the Jallandhar beach. Travelers to Diu also visit an ancient Lord Shiva Temple, situated near the Gangeswar coast. Diu is famous for beaches like Nagoa beach which is a popular tourist spot for people in Gujarat as well as outside Gujarat. Many adventure sports like boating and parasailing are conducted here. It is interesting to note that Diu is the only place where alcohol is allowed and legal in Gujarat by the authorities. The Diu beach is regularly thronged by people round the year for its beach facilities and the nearby resorts. Accommodation is available from budget hotel to a luxurious hotel for all types of guests. Seafood is easily available on DIU beach as well in nearby restaurants. The Nagoa beach is very busy during weekends with thousands of people visiting the place for swimming and activities. Photographers also visit the place to take photos of many types of birds that visit the islands. The evening time presents a wonderful sunset location with many shopping items for travelers, that range from sea shore items to design handicrafts. The sea shell museum near the Diu beach is well known for its variety of sea shells in various sizes and types. The City of Dwarka is regarded as one of the important places of pilgrimage for worshippers of Lord Krishna. It is located in/near Jamnagar. Lord Krishna resided in the city of Dwarka in his times. The city is famous for the ‘Dwarkadhish’ temple as well as for its beach. The distance from Ahmedabad to Dwarka is approx 400 km on road, 220 km from Rajkot. Train can be taken to go to Dwarka. Pilgrims who visit the city in the temple make it a point to visit the beach as well. It is a small island, that is famous among people for coral reefs and spotting dolphins in the sea along with the regular sea wildlife like the tortoises, fishes and the octopus. Scuba diving is also an important activity taken by enthusiasts on the beach. The city of Dwarka is also situated near the Gomti River Bank and also near the Arabian sea. People visiting Dwarka and its beach can easily find accommodation nearby with quality food. 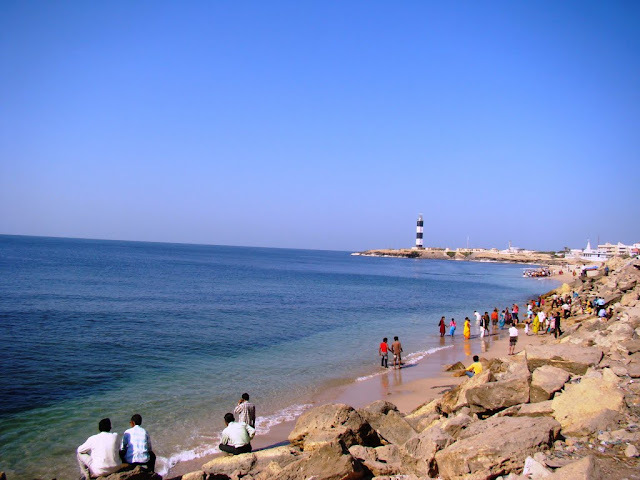 Visitors visiting the Dwarka beach are always intrigued by the peaceful atmosphere of the city and the calm water of the beach. The Dwarka beach though famous and known, provides a silent and secluded atmosphere for anyone visiting the place. Hotels for all types of budget costs are located in Dwarka. The beautiful temple of Lord Krishna near the beach gives a good photo shoot against the early morning sunrise and sunset. The Mandvi beach is situated in the city of Mandvi, and in the Kachchh district of Gujarat. The city of Mandvi is also famous for the shipbuilding industry near the Rukmavati river. The city is about 450 km from Ahmedabad and only about 55 km from Bhuj. The Mandvi city has also a private beach known as the deluxe camp. This beach is property of the exrulers of the city. 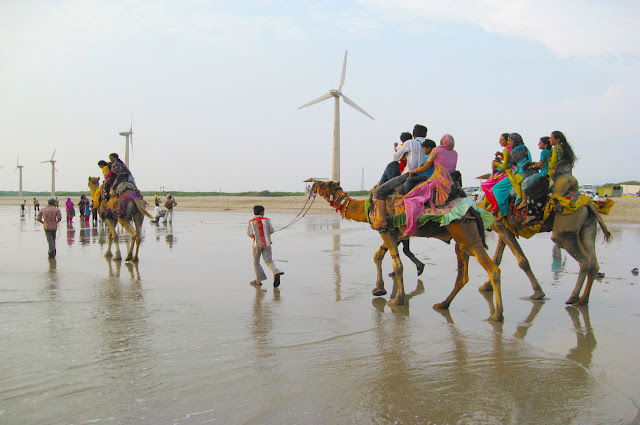 People in thousands visit the beach to enjoy the various amenities like massage, swimming, beach games, horse and camel rides and for a day picnic. Other activities like beach volleyball, nature walk by nature clubs and occasional boating is also undertaken by people. The beach is famous for its sea shells found nearby. The Mandvi beach is also famous for water sports like para sailing, skiing and surfing for adults, not to mention the fishing activities. 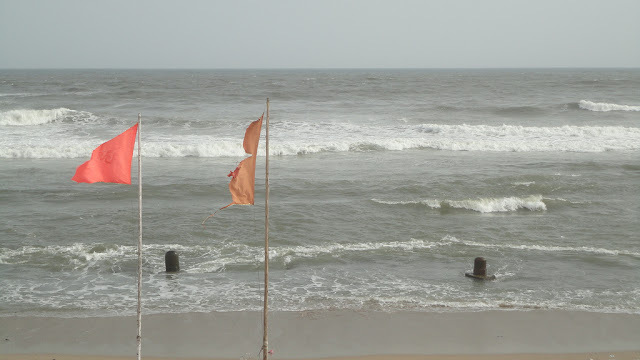 One of the other known places in Gujarat known for its beach location is the Gopnath Beach. The Gopnath beach is a beach near the Talaja village of Bhavnagar in Gujarat. The beach is located on the Gulf of Khambhat coast. The distance from Ahmedabad to Gopnath beach is approximately about 275 km and 72 km from Bhavnagar. Railroad can be taken to Bhavnagar if visitors want to travel by train. People visiting the Gopnath beach make it a point to also visit nearby places like the Talaja Jain temple, The Gopnath temple and the Jhanjmer fort. The beach of Gopnath is famous among people for the beautiful sea coast and good view of the sea coast with a variety of birds and sea items. The beach is famous for the firm sand for morning and evening walks. The Gopnath beach also has reportedly the world’s biggest ship breaking yard zone. People come on this beach to have a relaxed swimming experience in its shallow waters and a nice sunbath or a body massage. People visiting this place can get an easy accommodation based on their budget in a nice hotel or guest house. The King’s cottage or the Maharaja’s cottage can also be accessed for a luxurious stay. The Veraval Beach is located close to Junagadh in the saurasthra region of Gujarat. The beach is very close to Somnath. The approximate distance from Ahmedabad to Veraval is about close to 400 km and 75 km from Junagadh. The beach is famous for its ancient ruins and old structures located near its banks. The beach is visited by people who love history as well as some adventure. Old ruins of the Patan gate and Junagadh gate lie nearby the beach. Because of the clean and pure air, it is a famous among people for early morning and late night jogging. 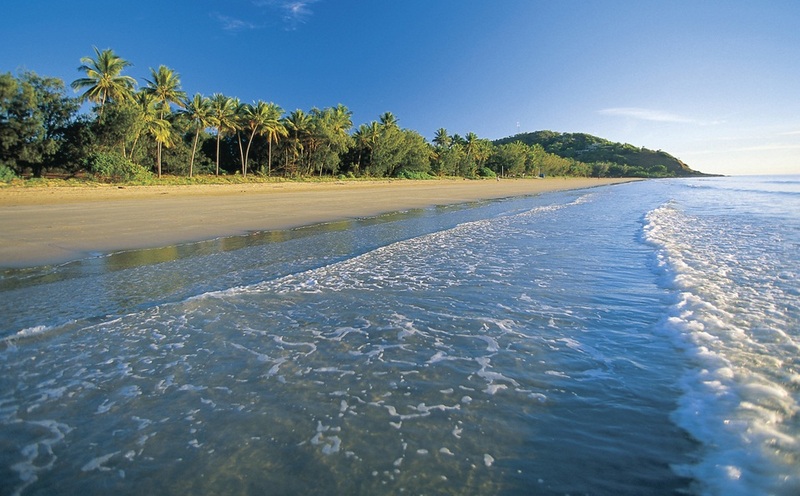 The Veraval beach is an ideal place for people who love swimming and fishing. Many varieties of fishes are found in the sea, as well as for trying out different sea cuisines. Many shopping camps are seen near the sea shore that sell various art pieces of Gujarat along with various handmade handicraft items made by local artists. The beach is visited by people from all over Gujarat in thousands round the year. It is worth to note that only a small portion of the beach is known among people while the majority of the beach is still unknown to most of the people.